This article is about the location. For the quest, see Ansilvund (quest). Ansilvund is a Nordic ruin situated northeast of Shor's Stone and northwest of Riften. It contains two zones: Ansilvund Excavation and Ansilvund Burial Chambers. The ruins are what is left of the tomb built by Holgeir in memory of Fjori, as described in the book Of Fjori and Holgeir. No Stone Unturned: Find the 24 gems to restore the Crown of Barenziah. The entrance is guarded by a leveled necromancer, usually found near the cooking spit, inside the ruined tower, or mining ore. In one of the cooking pots is a dead mudcrab, with a wooden table nearby which has a copy of Of Fjori and Holgeir, two red and two green apples and a rock warbler egg on top. There is an iron ore vein a short distance north of the cooking spit. Inside the tower is an apprentice-locked chest, several food sacks and a barrel containing ingredients with a small coin purse on it. Beside the chest is a hay pile you can sleep on. An alchemy lab is on the opposite wall, built into a table, with samples of fly amanita, bleeding crown fungi, a nightshade flower and bunch of lavender and four random healing, magicka or stamina potions. Beside the table is a bucket containing a random potion of magicka. On top of the tower is an unlocked boss chest, which can only be reached using at least two words of the Whirlwind Sprint dragon shout. To reach it, stand on the small rocky outcropping almost directly above the excavation entrance and face west toward the lowest part of the tower. Immediately to the right of the entrance to the excavations is a thistle. The passage descends to the east, passing a wooden table on the left which holds two pickaxes, a pair of iron boots, two leather helmets and a leveled blacksmith's potion. At the bottom, as you enter a chamber with a rock pillar surrounded by scaffolding and a raised walkway, there is an iron ore vein on the right. Under the scaffolding, to the south, is a path that ends with a draugr standing guard near some dead frostbite spiders, with a ledge above that will provide a short-cut back from the final zone. The only way to proceed is up the ramp found on the north side, around the back of the structure. There is a leveled draugr patrolling the wooden walkway. Follow the path around the pillar and along the walkway. Ahead is a ramp leading up and a passage continues ahead. Before following the passage, climb the ramp to a small landing to find a novice-locked chest. The passage continues heading east, passing stacks of crates and posts that are supporting the ceiling. As you pass under a wooden slated section you can peer through and see a leveled necromancer sitting watching two draugr mining the back wall. At least one of these draugr is leveled. The floor is coated with an oil slick and an oil lantern hangs above. There is a stack of barrels against the east wall with a random potion of magicka on top, however, it may become dislodged during the skirmish. To the left of where the draugr were working, next to the passage you just come through is an adept-locked chest, beside another stack of barrels. There are numerous pickaxes throughout the site and several of the barrels contain ingredients. There is a passage to the left of the first barrels continuing east. The passage twists and turns before you come to a pressure plate that triggers a falling boulders trap on the left, it can be used against a conjurer on a platform above you. The path onward is around the corner, on the other side of the pressure plate. The next room has several growths of both white cap and imp stool fungi. There is a wooden ramp on the left up to a platform where the mage is found. There is a table with two mummified draugr and a random potion on top. Beside the table is an apprentice-locked chest and at the other end of the platform, there is a small table and chair, with a random poison on the table. Ahead, there is a draugr patrolling above the next passage, that can be killed from here with a bow or ranged magic or left until later. I am Lu'ah Al-Skaven. Who are you to disrupt my work? Begone, or I will add you to my army of the dead! This chamber is brightly lit by a brazier in the center of the room, behind this is a platform where you will see another mage and draugr. You will need to pass under the platform to find the ramp up. This leads to a platform the front of which has a long table with another mummified draugr, however to the rear are several crates, barrels and five mummified draugr on the ground all of which can be looted. There is also a ramp descending to the south into a chamber containing three leveled mages standing or sitting around a central campfire. On your right, on the platform are three unowned bed rolls, with several crates and food sacks to the right of the ramp. 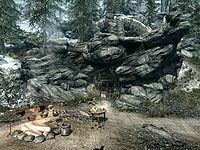 Around the fire on the ground are many bottles of wine and against the opposite wall is an arcane enchanter with a salt pile on top. Under the platform are many crates and barrels with several ingredients and foodstuffs on top, including; two taproots, a bowl of Spriggan sap, a bunch of tundra cotton, a bulb of garlic, a loaf of bread, several pieces of cheese, some potatoes, some cabbages and hanging under the platform is a garlic braid. Rise from your graves to defeat this worm. At which point they will all rise and can lead to a challenging fight. Once you've dealt with them, you will see a passage on your right. Pass this and a short distance further is a cave-in. Among the rubble is an unlocked chest. Return to the passage and follow it. Before entering the next room, take note of the circular floor, and the ceiling spikes. Skirt around this area to the wooden stairway. Two large urns are tucked away under the stairs, and three random filled soul gems; one on a sideboard and two in stands to the right. At the top of the stairs an apprentice-locked chest is straight ahead, a sideboard to the right has three loose septims and two lockpicks on top, while to the left are two more large urns and a food sack. Another draugr can be observed mining down below and either left or dealt with by ranged magic or bow. Beside the draugr is a small round table with a random empty soul gem and two random potions. Stairs in front of you lead down, at the bottom a passage heads south before taking a couple of turns. Descending deeper underground, continue along, until you reach a turn to the left by some wooden planking, here you need to take care, as there is a tripwire which triggers some rocks to fall from the right. Looking around, you will see a wooden platform supporting a stone bridge spanning the room. A draugr, a random atronach and a conjurer are all guarding this area. Before heading down to the wooden platform, look to the right for some candles on a section of stone statuary. A coin purse is behind this stone structure. Head up the incline on the far side of the room to find four puzzle pillars and an associated lever on one side of the bridge and an iron portcullis on the other. On the table below the puzzle are three random potions, Lu-ah's Journal, and another copy of Of Fjori and Holgeir. The book contains clues to solve the pillar puzzle. The solution can also be seen carved into the wall behind the table, below the pillars, but they are partially obscured by rubble and weeds. The solution from left to right, is Eagle—Snake—Whale—Snake. Activate the pillars to arrange them in the correct order, then pull the lever and proceed across the bridge. There is an additional trap on the bridge; the middle section has a pressure plate that activates a flamethrower statue trap from the right. In the next room, an unlocked chest is in a darkened alcove to the right, and the doors straight ahead lead to Ansilvund Burial Chambers. I shall have vengeance for the death of my husband. Rise! Once you have the key, go up the stairs to find an adept-locked chest. A series of stone bridges spans the room. The Ansilvund key unlocks the first master-locked gate to the right. An unlocked chest is in this caged section of the bridge works. Continue across to the balcony to the north where you find three large urns and further along the wall a set of shelves holding two bottles of alto wine, a woodcutter's axe and a pair of iron boots. To the right of these is a wooden door. Behind the door is an alcove containing a few human bones, but nothing of interest. Opposite is a caged bridge with another master-locked gate that is opened using the same key as before, crosses to a small balcony, with a partially buried urn and another wooden door. Through this door is a passage that leads to a room with wooden supports and a draugr attacking what appears to be a gold ore vein (see bugs) with their weapon. Water covers the floor in the next room, and a leveled conjurer will be patrolling on the walkway crossing above. A wooden ramp up to the next level is in the back of the cavern, to the north. At the top of the ramp, on a stone ledge, to the right, next to some candles is an empty petty soul gem and an iron dagger. I could not raise him, but I will raise an army to avenge his defilement! Six more draugr awaken from their slumber. Three of the alcoves by the thrones contain mummified draugr, with a large urn in front. The passage continues to the north. As the room opens up through some scrub brush, you will see a trapped pedestal straight ahead. First, notice another circular floor section with ceiling spikes. If you want to reach the pedestal, skirt around the circular floor. While there is a piece of random armor lying on the pedestal, taking it triggers a poison dart trap from either side. Up ahead, there is a single draugr patrolling the hallway before double iron doors, leading to the final area. Opening the doors reveals the final area of the ruins. Awaiting you is Lu'ah Al-Skaven, a powerful necromancer, and two powerful draugr or dragon priests, Holgeir and Fjori will emerge from upright sarcophagi that she controls. There are three skeletons lying on the ground, any of which she may raise to aid her and in front of her an altar with a dead draugr and two random potions of magicka on top. Between the sarcophagi is a stone table with a built-in arcane enchanter, an unusual gem and a plinth where they place ghostblade, as a reward for releasing the captive spirits of Holgeir and Fjori. You do not have to be on the related quest to encounter these foes and gain the ghostblade prize. After the fight, loot Lu'ah Al-Skaven for her key. Next, when standing at the altar, facing back towards the entrance, notice two sets of stairs. The stairs on the right go up to an unlocked chest buried in some rubble. The exit is up the stairs to the left. The master-locked door at the top of the stairs will be unlocked with her key. In the room beyond are two barrels of ingredients, several burial urns, a large urn, an unlocked boss chest, an unowned single bed, an alchemy lab, with a long wooden table to the right with a spell tome: Transmute Mineral Ore, a note, which tells of the death of Lu'ah Al-Skaven's husband, Saeel Al-Skaven, two random potions and a dragon's tongue flower on top. To the right is a kettle containing two pieces of iron ore that you can try out the new spell on. To the left of a door on the far wall is a set of shelves holding a deathbell flower, a bowl of frost salts, a bowl of bone meal, a dragon's tongue flower, two random empty soul gems, a random dagger, a set of novice robes of conjuration, a pair of boots, and four common books. Through the door is a passage that leads to a wooden spiral staircase with a barrel of ingredients and several food sacks at the bottom and a cage with a door that requires her key to open. This brings you to the ledge above the dead frostbite spiders in the excavation area, with easy access from here to the exit. To the east of the camp is a quicksilver ore vein and farther east an iron ore vein. Between the two but to the south is a corundum ore vein. If you return to the ruin after completing the eponymous quest and the location has reset, most draugr will not respawn. A small number of skeleton enemies will take their place along with the necromancers, making for a much easier path through the ruin. There is a gold ore vein that cannot be mined, found on the wall to the right, just after the room that holds the key and skill book. There is a draugr attempting to mine it, with a battleaxe. This page was last modified on 14 April 2019, at 08:48.